Millions of people book his online tickets from IRCTC’s website on daily basis. Last year, the IRCTC website was upgraded and become more user-friendly. As per the latest information IRCTC Website will not be accessible for Windows XP Users to booking the online tickets. IRCTC stands for Railways Catering and Tourism Corporation. IRCTC recently announced that IRCTC website is being migrated to TLS 1.1 and TLS 1.2. TLS 1.1 and TLS 1.2. 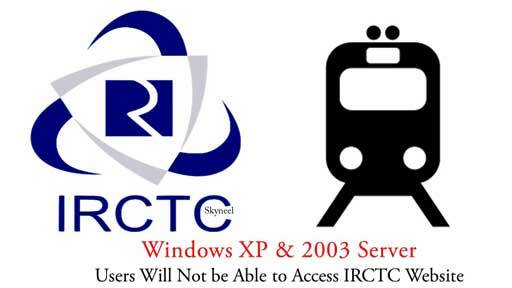 Due to that reason IRCTC website will not be supported by Windows XP and Windows Server 2003 operating systems. All the peoples who are working with Windows XP or Windows Server 2003 at his computer system or laptops will not be able to access that IRCTC website after migration. Most people have started train and airways booking tickets online due to the website being user-friendly. Due to that facility, there has been a too much decrease in the rush on the Railway Reservation Center. Most of the users able to book, cancel his online tickets via IRCTC. They have to uses debit card, net banking, credit card, mobile wallet and other feature to pay the amount against the booking. Due to increase the security issue IRCTC website migrated to TLS 1.1 and TLS 1.2 for all online transactions. Now, if you still working on the Windows XP or Windows Server 2003 Operating System then you are not able to book your online tickets. You have to upgrade your operating system to get the benefit of online booking via IRCTC. IRCTC has recently started free-to-cost travelling insurance facility. In this facility they can get the insurance benefit up to Rs 50 lakh, for air passengers. The benefits of this insurance will be to applicable for all the classes of passenger. Apart from this, whether you are travelling abroad or travelling home, you will get the benefit of this insurance. In case of Accidental death or Permanent disability, the relatives of the passengers will get the benefit of this insurance, if they booking tickets via IRCTC.